BOB, pictured above, is the founder and Chief Instructor at the Global Survival Institute. After receiving his MBA Bob joined the United States Army where he received 13 months of combat training at 4 different military training centers. After being commissioned as an officer and receiving his above top secret clearances he commanded a classified military operation in Europe for several years. After departing the military Bob managed several divisions of a fortune 500 company for fifteen years, founded the Global Survival Institute, started a number of small business enterprises and purchased two companies. Bob is a licensed pilot, scuba diver, expert survivalist, international privacy consultant, entrepreneur, author of many magazine and newspaper articles, has been approached by many TV networks worldwide to assist in survival related productions and a past member of both the United Martial Arts Federation and the International Combat Hapkido Federation. Bob lives an extremely private and self-reliant lifestyle at various remote wilderness locations worldwide and was, for many years, a routine contributor to the American Survival Guide magazine. DIANE, Bobs personal assistant, pictured here spotting rounds at a private weapons class conducted by Bob in 2008. Diane has a PHD, is a licensed pilot, a 3rd degree black belt, and speaks Spanish, French, and Italian fluently. ​She attended one of Bob's classes in 2003 and has been associated with the school ever since. DIANE, shooting fish with a bow during a private class conducted in Canada during the summer of 2005. She is expert with a vast number of different weapons. ​DAN is pictured here deep in the mountains of Idaho. Dan is one of the few true mountain men left in this country today. He lived deep in the mountains of Idaho for many years and guided hunters into those mountains. He lived off the land for months at a time and survived some of the worst weather that can be found in North America. He has experienced hunger, cold and thirst first hand as he has pushed the limits of survival on a number of occasions. He is an expert survivalist and right at home in the woods or the mountains no matter how harsh the conditions might be. CHUCK is a former Navy Corpsman and Air Force Medic who served in Vietnam with 1st Recon Battalion, 1st Marine Division. Chuck was wounded in action in Vietnam while aiding wounded soldiers on the battlefield. Before founding Medical Corps in 1995, Chuck worked in Hospitals, ORs and ERs across the United States. In 1998 he published the correct dosing information for the prevention of Anthrax and Plague--long before the infamous Anthrax-laced letters hit Washington. Medical Corps was founded to teach the general public and medical professionals how to survive without the benefit of our hospital or clinical infrastructures. Chuck and his family moved to Ohio in 1997 after Bob invited him to Ohio as a guest speaker at the Global Survival Institute..
ERIC started his training in combatives and survival at the early age of 8. His journey of 21 years of experience has consisted of numerous fortunate opportunities to train in many unique locations including; Russia, Okinawa, Korea and Japan and has all the skills of a ninja. Having the honor and pleasure of training with some of finest instructors in the world on hand-to-hand combat, Eric has many unique supporting skills to his system of combatives which includes: Combat/Wilderness first aid instruction, primitive and modern Wilderness Survival instruction, NRA Certified Pistol instruction, Personal Protection in the Home instruction, Physical Fitness instruction, and basic Escape and Evasion skills. Nicknamed "the assassin" by his peers he has designed several lethal combative training programs for the military. ​MARK pictured here rappelling the New River Gorge in West Virginia. Mark, a graduate of Purdue University, has been associated with the school for over fifteen years. He trained under Chris Janowski, U.S. Special Forces who was also associated with the school until he passed away. Mark has his concealed carry license, and has received extensive training in tactical weapons, wilderness survival and rappelling. ​JEFF has been associated with the Global Survival Institute for several years now and has assisted with every aspect of the training. 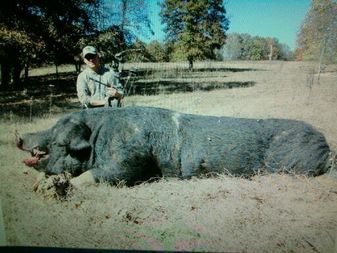 Picture here is Jeff next to a wild Boar that he bagged with a bow. He is an avid hunter and gun collector, has his conceal carry license and extensive knowledge regarding weapons. SUNSHINE grew up on her Native American grandparents' 27-acre self-sufficient farm. There she learned about the local plants, animals and how to operate the farm without the use of machinery. She began learning the arts of survival and self-sufficiency from an early age. This knowledge was the basis of her success, when for over a decade she used her tracking skills with her canine partner as a Search and Rescue officer to find missing people. Today, this respected lecturer, who instructs classes on wilderness survival, edible, medicinal and utilitarian plants at the Global Survival Institute continues to share the knowledge given to her by her Native American grandparents. Her writings bring her skills and knowledge to her readers along with the insight and wit that are her trademarks. She is an expert with weapons and hand to hand combat and could be dropped anywhere in the wilderness with no gear and survive. Tony has been featured on NBC News, the Travel Channel, and in Outside Magazine. In addition to extensive experience in wilderness survival, Tony has a BA in anthropology and is nationally certified as a Wilderness First Responder through the Wilderness Medical Institute of NOLS. He is the author of two books on outdoor survival and is also a well published writer and photographer in numerous magazines such as Backpacker, Wilderness Way, Backhome, Popular Woodworking, and Backwoodsman. TOM pictured here starting a fire with a hand drill. Tom specializes in primitive survival skills. He is a licensed pilot and scuba diver and holds a federal firearms license. Like other staff members he has his own homestead and relies very little on conventional sources for his basic needs. Tom teaches a host of survival related topics and is very skilled at a number of survival techniques. You could drop Tom anywhere in the world with only a knife and he would survive. ﻿GUY (center) is teaching students the proper method of cleaning fish. Guy lives on a beautiful and very scenic 400 acre wilderness retreat complete with several ponds and lakes which he personally developed and stocked with fish. Guy fed his entire family throughout the years primarily off his land as a substantial part of the family diet has been venison, fish and wild turkey supplemented by many greenhouses and gardens. Guy assists with survival instruction and is one of the foremost authorities on homesteading and self reliant living in the United States today. Guy is very knowledgeable at developing natural springs, ponds, lakes, and wilderness cabins using actual logs and is the recipient of many wildlife awards as a result of his efforts in developing habitats on his own property that are well suited to supporting every kind of wildlife.